As a coach, Mike Joyce was won seven Eastern Athletic Conference championships. As a player he helped his team win two more. Mike Joyce anxiously paces in front of the Vineyard bench on Monday afternoon with folded arms and a furrowed brow. The score is tied with 38 seconds left against Monomoy High School. Monomoy has the ball and the Vineyard crowd is on their feet, stomping the bleachers. “Hands up hands up! Contain contain!” Coach Joyce yells over the roar of the fans. A Monomoy player shoots from within a tangle of arms and the ball slips through the net. With 30 seconds to go, Coach Joyce calls a timeout. The players circle him while he marks out a play on his whiteboard. The team chants “one, two, three, go Vineyard,” and charges onto the court. The Vineyarders move the ball around the perimeter, then to the inside, but the shot misses. A Vineyard player grabs the rebound and passes it back out to reset the play. One more chance. The ball arcs high from the three-point-line with less than 10 seconds to go. Coach Joyce’s eyes widen and he leans forward, almost stepping onto the court. But shot bounces off the rim into the hands of a Monomoy player. A pair of free throws secures the win for Monomoy, 59-55. Despite the disappointing finish, Coach Joyce cracks a smile. “I’ll take that kind of game any day over a 30 to 40-point blowout win,” he says. Now in his 16th year coaching the boys’ basketball team, Coach Joyce has felt the thrill of victory far more than the sting of defeat. In January, he netted his 200th win, making him the third winningest basketball coach in Vineyard history. He called it a long, memorable road, starting at age 34 when the former junior varsity girls coach was asked to move to boys varsity after the coach quit two days into the season. “Going back through all the kids, the different teams, the number of hours, the time, the energy, the Advil . . . it’s a great feeling to look back at that and how much fun we had and how much work we put into it,” he said. Asked to pick out one of his more notable wins, Coach Joyce can chronicle the details of the game down to how much time was on the clock for the buzzer-beating last shot. 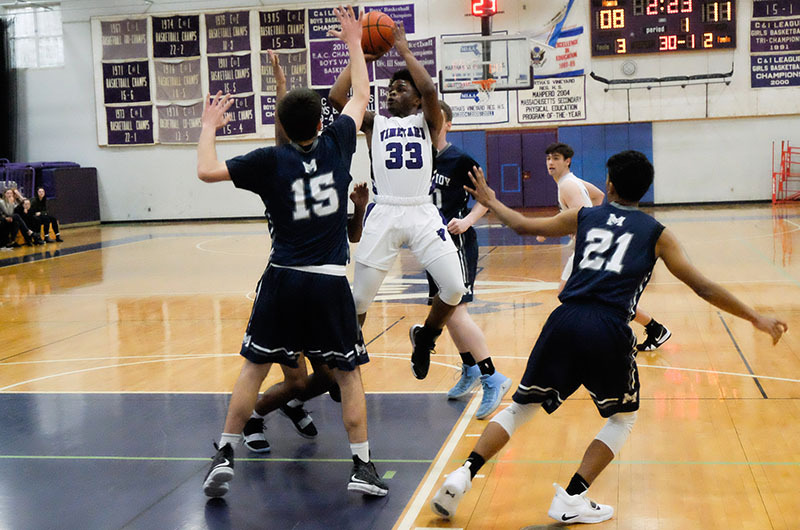 He recalled a game against Bishop Feehan five years ago as one of the most memorable, when Vineyarder Brandon Watkins blocked a shot and scored with two seconds left to win the game. Born on the Island, Coach Joyce started his basketball career at age seven when he and his friends would bike over to the Oak Bluffs elementary school court to shoot hoops. He was hooked and later joined the Vineyard high school team as a center, helping lead his team to a pair of Eastern Athletic Conference championships. 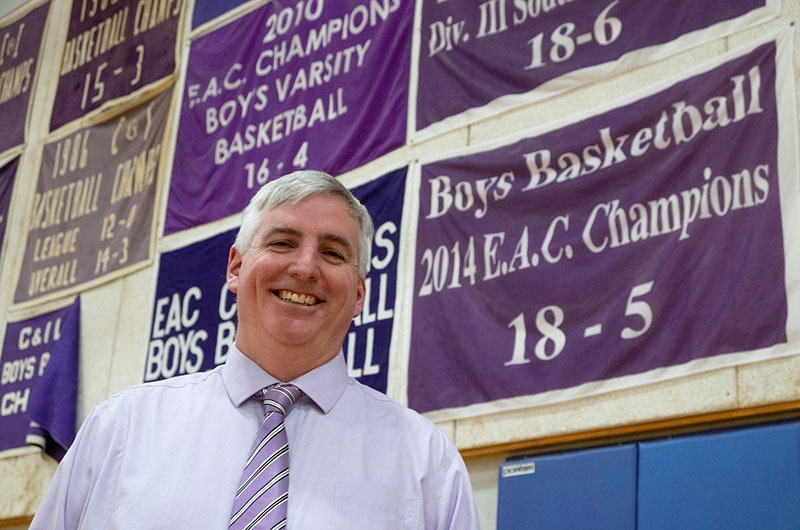 As coach, he’s added seven more EAC titles to his collection, along with recognition by the Boston Globe as the 2011 division three coach of the year. He said the keys to his success have been learning to adapt to the ever-evolving sport and a revolving door of players every few years. As for his aggressive, up-tempo coaching style, Coach Joyce pointed to his beloved coaching predecessors Jay Schofield and Nelson Oliver as inspirations. He joked that due to his constant pacing, he’s almost as tired as his players after a game. He added that he has to resort to repeatedly yelling advice to get the message across. “Once will never go through when you work with teenagers,” he said. Coach Joyce emphasized that while coaching on the court is important, he takes the most pride in molding his players into mature, young leaders in the classroom and community. “When you coach, it’s another level of being invested in their lives and making sure they have the chance to become successful. Basketball is the fun part, but there’s always a little more in there than that,” he said. Looking ahead to the possibility of tacking on 200 more wins, Coach Joyce said he’s not ruling it out. But for now his focus is on preparing for the next game and the postseason. The team is currently 7-6, and plays Sturgis Charter School on Tuesday at 4:30 p.m. and Nantucket at home on Saturday at 2 p.m. When I heard that Coach Mike Joyce reached his 200th win, I was totally elated. It's likely he will break the coaching record for the most wins. Records are made to be broken. For that, too, I am thrilled that a former player of mine is on that level of excellence with his program and it can only get betterr. Coach Joyce was always a hard-working athlete on my teams in the mid-80s, a gentleman, and an enthusiastic, knowledgeable, coach. His basketball connection with our family included his having my two sons, Shawn and Scott, as his MVRHS teammates and even extended to my grandson, Shane, who had the opportunity to play for Mike. That completed the generational circle for which I am thrilled. Great job, Mike, your old coach is extremely proud of you and will continue to be so after your next 200 wins! My son is a Sophomore at M.V.R.H.S and is on MJ'S Varsity team. He is a wonderful coach. This is my first years experience with him and I couldn't be happier. He cares for these young men on AND off the court. Congratulations Coach on your 200th win!!! Thank you for all you do for these young men!! The scary thing is that he’s an even better golfer. Congrats on your coaching career. You certainly have a passion for Basketball and your enthusiasm motivates your players! We wish you continued success for many more years!